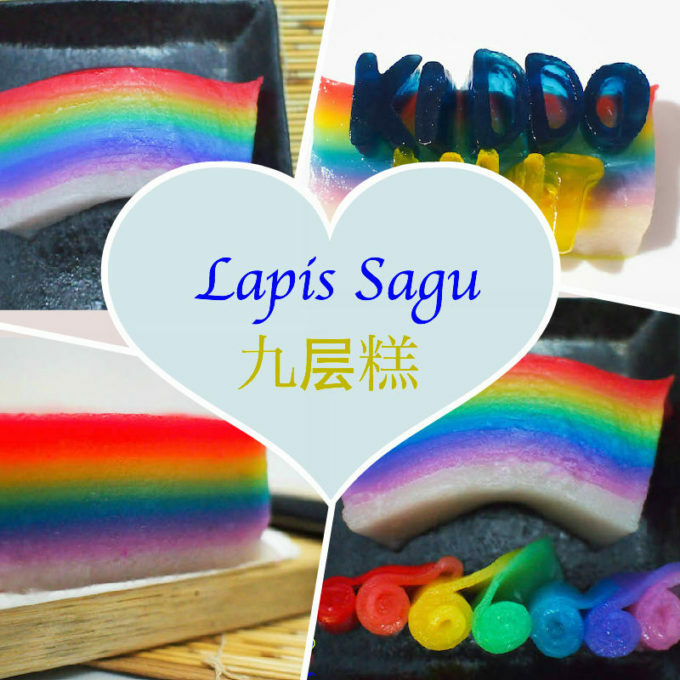 Another of my favourite childhood snack – Lapis Sagu 九层糕. What’s nice about Lapis Sagu? I love the stretchy texture, the coconut aroma and the peeling layer by layer. And, I am always attracted by the colours as well. However, what I could get from the stalls is sweet, too sweet for me. So, what’s next? Make it myself! After trying to make this twice, I suppose this is a snack I won’t be making often. 3+ hours is the total of time I used to make a tin of Lapis Sagu, and I could not break the steaming time, I need to steam all the way which takes more than an hour for the 15 layers. 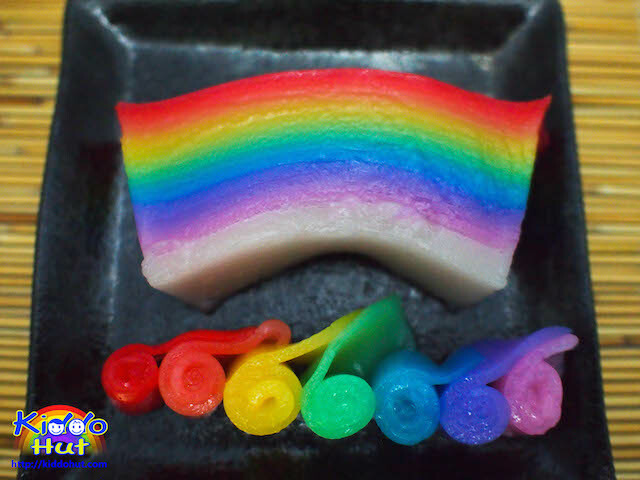 Although it is known as nine layers kueh, after making the first time, I learn that it is not really nine layers if I do not want each layer to be very thick. Otherwise, I would have a shortie kueh. Looking at Lapis Sagu and the edible colour palate I have, I decided to make a rainbow Lapis Sagu unlike the traditional green and red. 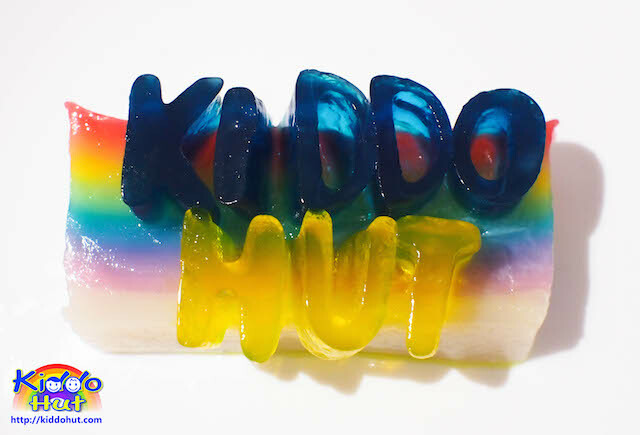 This Rainbow Lapis Sagu takes resemblance to Kiddo Hut’s logo. I have tried two recipes whereas for the first recipe, I did not quite like the texture of the Lapis Sagu as it was harder and less stretchy. Then, I saw another recipe from travelling-foodies (who has reproduced his recipe from Shirley’s blog entry and the original recipe is from Patricia Lee’s 娘惹风味糕点), which uses four different kinds of flour and it is the first time I will be using the mung bean powder, I was very keen to try it. This is softer and relatively more elastic (it actually stretched approximately another 20%) yet not rubbery! 1. Ensure you have adequate water in the steamer as you will need to steam at a marathon for more than an hour. Do keep an eye on the water level and you need to have a pot or kettle of hot water ready to refill. I have refilled once and forgot about refilling again, and burnt my steamer. Luckily, my Lapis Sagu didn’t get affected as I was steaming the last layer when the water gets dried up. 2. Refill the water in the steamer when the layer is cooked. Before you add the next layer, quickly refill the steamer with hot water and turn up the heat to high. In this way, the temperature within the steamer may decrease a bit but not too much to affect the cooking of the next layer. 3. 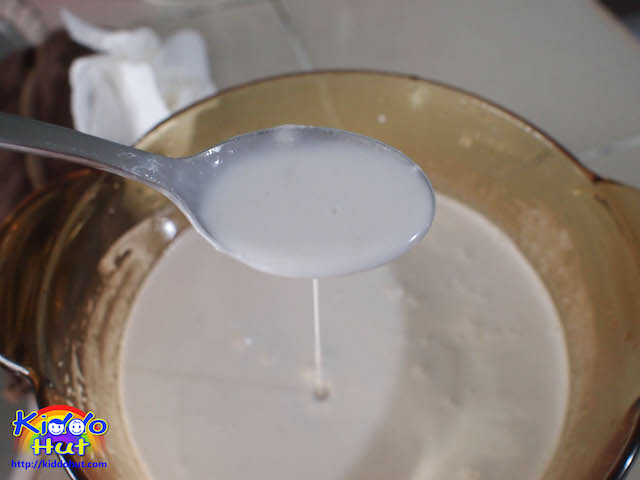 Before greasing the tin, measure the amount of batter for each layer by sampling with some water in the tin to desired thickness and pour the water into a measuring cup to take measurement of the quantity. Alternatively, you can use a ladle as a gauge as the blogger suggested but personally I prefer to pour the batter into a measuring cup before pouring into the tin for steaming. 4. As I do not have a 9″ tin, I have scaled down the recipe by 50% i.e. 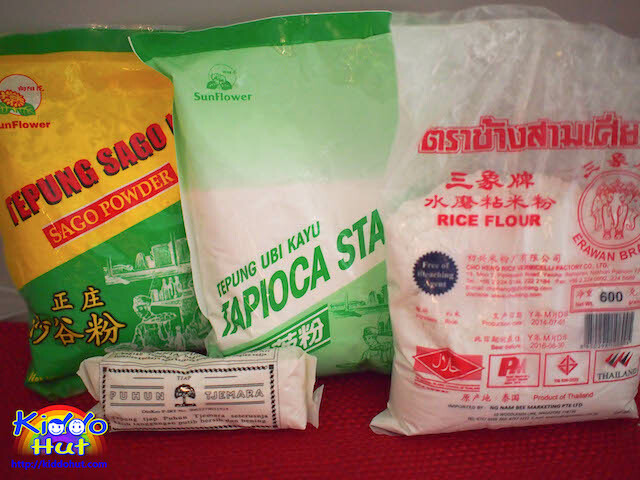 I used 240g Tapioca powder instead of 480g per recipe, for my 8″ by 3.5″ tin. 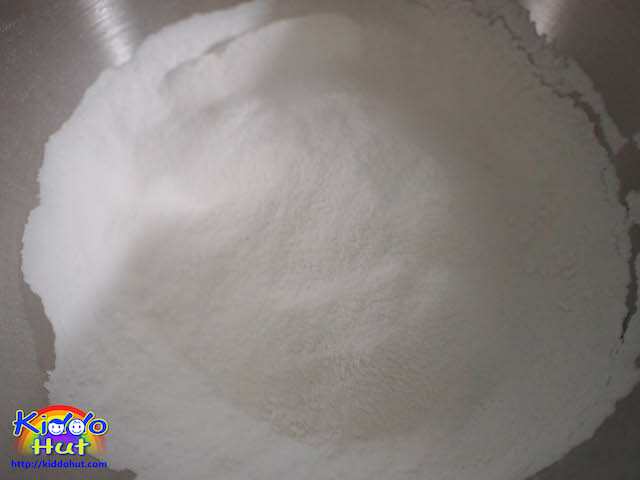 It is always good to have surplus batter than inadequate batter. 5. The blogger has used a mix of coconut milk and coconut cream. 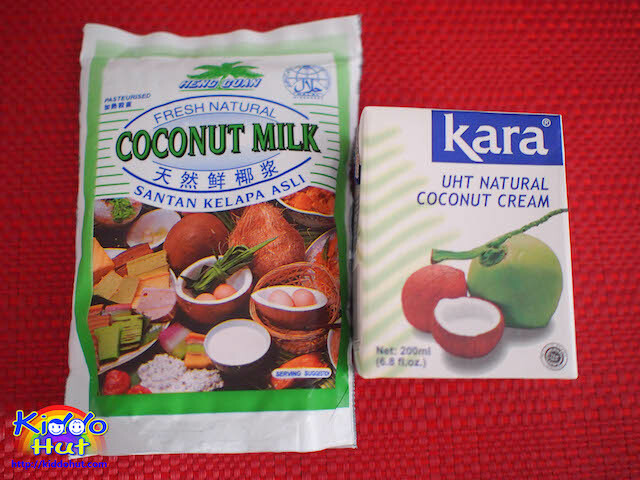 I have followed the same although he didn’t provide the proportion, I have used the 200ml in a box for the coconut cream and 250ml in a package for the coconut milk. It gives a very aromatic coconut smell in the kueh. 6. Instead of bundling the pandan leaves, I have cut the leaves into half for the smell the defuse faster. 7. Remember to stir the batter each time before adding layer as the powder mixture would settle at the bottom after the waiting time. 8. Although the recipe calls for 1 litre of water, you will need to top it up to 1.5 litre after the syrup is made. 9. Cover the steamer with the steam cloth to prevent the water vapour from dripping into the kueh. 10. Grease the knife before cutting. You will also need a greased knife to loosen the sides of the kueh from the tin to ease the removal from the tin. Last but not least, if you notice, every colour is made up of 2 layers except the white first layer which is always thicker. Otherwise, you need a thick layer to show the colours but I don’t appreciate to eat so much flour for each peel. So essentially, it is more than 9 layers. Mine was 15 layers as I have 7 colours plus a layer of white (which is the cloud, to be creative). I wanted to have 3 layers of red, but I burnt my steamer before I could add my final layer which is fine since I kept to 2 layers per colour. 1. Boil 1 litre of water, sugar and pandan leaves. After sugar melts, strain the syrup, dilute with water to make to 1.5 litres and leave it to cool. 2. Mix all the flour and salt together. 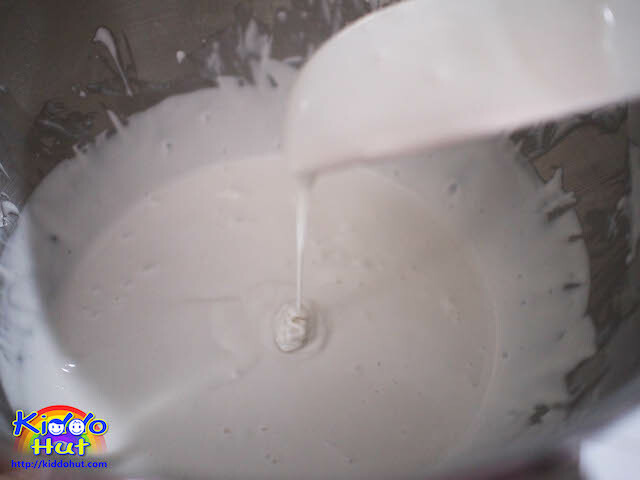 Pour the coconut milk mixture (coconut milk and coconut cream) a little at a time and mix till smooth. Set aside. 3. Pour the syrup from (1) into the flour mixture. Stir constantly till well blended. 4. Divide mixture into 8 portions. Leave one portion uncoloured. Mix each portion with different colouring. 5. Grease the aluminium tin with a little oil. Pour in the uncoloured mixture and steam for about 10 minutes. Repeat another layer with the coloured mixture and steam for about 6-7 minutes. 6. Repeat step (5) with other coloured batter until all batter is used up. Top layer must be red. Leave the cake to cool at room temperature for 3-4 hours before cutting with a greased knife. See how thin is each layer!